I've always been fascinated with matte paintings, so today I'll explain the basic principles they involve and demonstrate the. What I do need to emphasize is that Matte Paintings are usually much larger in scale, harbour more detail and require a lot more time to create. You can find the Photoshop PSD file in a directory labeled 'source' that came in the ZIP file that you downloaded. You may wish to look through them briefly before we begin. 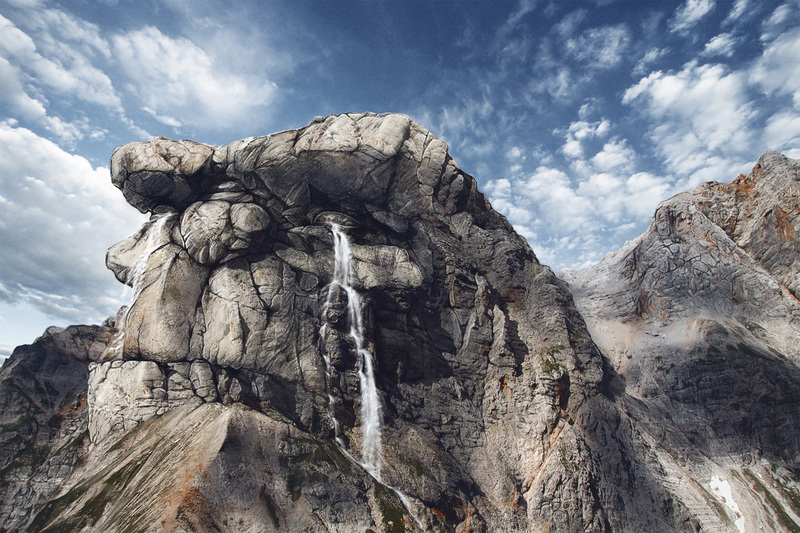 The first you need to do is grab this cliff image and open in it Photoshop. We're going to use it as is, and draw directly on top, so there's no need to create a separate document. Insert the large version of Andrei's sketch into the Photoshop document. Change the sketch's blending mode to Multiply and position it on the front cliff. I've duplicated the sketch here a few times, so it's easier to see. You'll now need to create the face segments using the sketch as a reference. Here's how I did it. Duplicate the Background image and add a Layer Mask. Then, in the Mask layer icon, fill the mask with black. That will make everything dissapear. 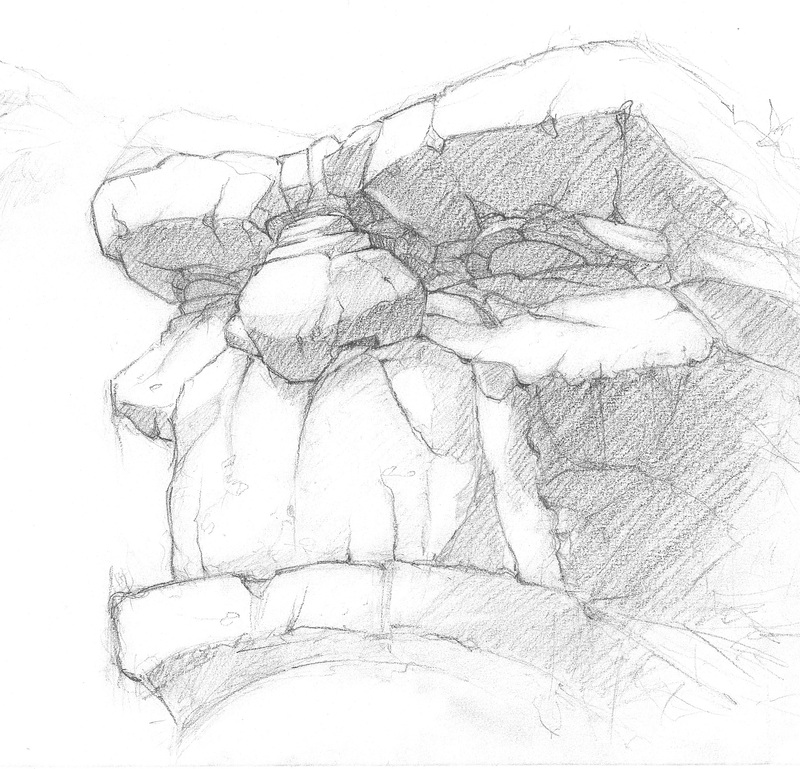 Then paint with white (staying within the sketch divisions) the area you'd like to use as a stone texture. Between the layer icon and the layer mask icon, there is a small chain icon. Press it to unlink the layer from the mask. Now, you can select the layer icon and move the image freely, while keeping the mask in place. This is important, because you want to use a different part of a rock texture in different areas of the face. I've outlined the different layers and their masks with a red outline for easy spotting. Move the sketch up a few layers, until it's on top. We're not only going to use the sketch as a reference image, but also incorporate it into the painting. Fortunately, we can use it to plan and draw the highlights and shadows. And here's how the mask affects the sketch layer. There's lots more work to be done with this mask, so grab a small brush and start fading out all that noise in the shadow areas. By now, the sketch is a mere black outline. Now you'll need to separate the image from its background. You can use the eraser tool, or hide it with a layer mask. Either way, we won't be using the original sky in this tutorial. Why the change of heart? The rather large cloud seems like an odd place to me, so I think this image requires something more complementary. Converging lines tend to draw attention on the intersecting point, so we're going to use a V-shaped sky photo that draws attention to our subject. Also, the much smaller clouds change the perception of the nearby mountins, and suggest that the cliff and head are larger than they really are. And here is the sky photo I was talking about in the previous step. Place it behind the cliffs, and rotate/transform/flip it in place. We're now going to alter the appearance of the sky photo. Go to Layer > New Adjustment Layer > Gradient Map and use a few similar colors. Then change the layer's Opacity to 50% and Blending Mode to Overlay. One more Gradient Map. Just a little B&W to match the saturation of the cliffs. And now, the toughest part is yet to begin! It goes without saying, that you need a pen tablet to do this part. Within the next steps, I'll show, in red, where to draw thin, 1-2px lines, and then reveal what they look like in the second image. This first section I've covered is a few black outlines. As you finish one area, move along to the next. There really is not much to say about this part. Standard brush settings apply. It's all about how you use the pen tablet! Revisiting and retouching areas is common. When creating these outlines, try not to go to a comic books style, where all the outlines are visible. Make sure they fit the look of the photo. You can also use the brush to add shadows. Remember to fade these lines into the cracks and follow the original photos you used underneath. This really is a metter of blending photo and sketch into one cohesive outcome. Moving along with the lines, don't forget to alter the other cliffs too. There's a good chance these black outlines we're making on the subject won't match the appearance of the rest of the photo entirely. Remember that the other ridges are further away, so keep those lines thin, and stone sizes smaller. While you'll move along to ares of more detail, you may need to draw more intensively, and accurately. Cover larger areas around the eyes, as to gradually darken them. Why use a small brush to darken large areas? Well, a large brush darkens evenly, and that's not appropriate to do with a harsh, rocky texture. That's why you need to follow the cracks and bumps when darkening a rock face, as it will lead to a much more realistic result. That's about it for shadows and dark lines. We're moving on to highlights, so from now on, paint using white. I've also switched the color to green as to avoid confusion. As you can see, the highlights stick to the top-left light source, and run along the dark lines. Don't overdo it though. Even though we're looking for an artistic feel, we're not trying to give each slab it's own bright white outline! I've bumped up my size to 5-10 px here, and lowered the Opacity of my brush to about 10-30%. That makes for some even highlights. I'd go easy on the right side of the face, as we're going to darken it considerably. As you can see, there's not that much line work here. Right here, I've drawn some highlights on the other ridge. Keep it simple and subtle! Turn down the layer Opacity to 70%. If you look at other existing cast shadows from the orginal photo, you'll notice that the shadows aren't exactly black. So add a Color Overlay Layer Style to our layer, and choose this color. Quick Shadows Tip: Shadows are never pure black. If you're not confident about which color your shadow to be in a scene, make the shadow color grey, rather than black, and set it on Multiply. That way you're not only darkening the layers underneath, but modifying color too. If you look at your subject's face, you'll notice that the overall form is not very well defined. You see it's texture, but not its basic form. To do that, we need a few modifiers like overall highlights and shadows. The first thing to do, is darken the part of the face opposite to the light source. Use a large brush size and very low Opacity. Repeated brush strokes should yield a similar result. We're not quite done with these shadows. Like I said before, it's not enough to run a smooth dark shadow over a rock texture to darken it. For a realistic result, you'll have to adjust it to the varying heights of the texture. To do this, add a layer mask to shadow, and hide portions of the layer, to lighten the image back up. All the thin lines act like the highlights we drew earlier, and the large black regions are to limit the shadows, where they shouldn't exist. And now, we'll add a few highilights to even out all the left side of the face. This highlight won't be perfectly white, as the sun's rays don't cast pure white highlights. Make sure you add a Color Overlay with an off-white. Another thing to simulate distance, is add a blue-ish haze to far away mountains. These ridges aren't that far, but like I said, we're going for a large scale look. Draw a blueish haze over them, and fade it out seamlessly. Make sure you tweak the Opacity until it looks just right! I've had some positive and negative feedback about the next move. I think the photo needs a little life, as it's pretty barren, and it fails to tell a story as is. So using a waterfall, not only adds a dynamic element to the scene, but also gives the image a sort of underlying plot that wins over the viewer. Also, the waterfall as tears is a very appropriate symbol, i think. Creating it wasn't easy, as it crosses a few borders I've never even been close to before! So far I've gotten away with using a tablet to modify images, but never drew an element from scratch. To recreate it, start off with a few small lines (1-2 px) that define the basic form of the waterfall. You may need to do a bit a research on images of waterfalls, like I did. I decided to go for a waterfall that ends up more like a foggy rain near the base - these waterfalls are large in size, so it works with the look we're going for. Make the waterfall interesting and just a bit unpredictable! I added a second course that falls off on the side. It's a good idea to use a bit of blue outlines in there too. Use the Smudge Tool (R) with a brush size of approximately 15 px to smear the thin lines in a downward, see-saw movement (pointed out by the blue arrows). Repeat this process over the entire waterfall. Use different brush sizes for different areas until you get a similar result. You'll also need to use the pen tablet to redraw a few white areas. Otherwise, the waterfall will look blurry. Add another on the subject's right cheek to complete the waterfalls. Where there's water, there's vegetation! Draw a bit of moss on the nearby ares. I also decide to add a few fying birds. You can draw these with a tablet. With a few final environment changes, we should be all done! In trying to make this image look real and believable, I decided to cut back on the overall black values. This will make it look more like a photo, that hasn't really had any color or contrast changes. To do this, on top of all the layers, change the dark levels of the image with a Selective Color Adjustment Layer. Now add a final effect that will tone down the colors and add just a bit more contrast. Layer > New Adjustment Layer > Gradient Map. The final image is below. You can view the large version here.